This unit was formed specially for the D Day Normandy landings. It consisted of specially developed vehicles or ‘Hobart’s Funnies’ created to undertake special tasks on the beaches on D Day and afterwards. One of the special tanks was designated the ‘DD’ Tank or Duplex Drive tank. The Duplex Drive tank was a specially modified Valentine or Sherman tank which was able to engage a propeller to drive it through the water. A canvas screen supported on inflatable ribs could be deployed to allow the tank to sit in the water without it flooding over the top of the tank. The 79th Armoured Division was to be the spearhead of the assault on D-Day. The tanks were to be taken to the Normandy beaches by landing craft. When the craft was close in to the shore the loading ramp was to be dropped and the tanks driven off and into the water. They were then to float onto the beaches, driven by their propellers (with a top speed of 5mph) , the skirts would then be dropped and the tracks engaged. The tanks were needed on the beaches to clear away through enemy obstacles and engage enemy machine gun posts, pillboxes and artillery batteries. The 79th’s vehicles were offered to all of the forces taking part in the landings of Operation Overlord, but the Americans declined all except the amphibious Sherman DD tank. The Valentine version of the DD Tank was used for training purposes only. The Shermans were the only DD tanks to be deployed on D Day. On D Day 176 Duplex Drive tanks were launched: 121 made it to shore. They were intended to be launched a couple of miles offshore. The Americans on Utah and Omaha stuck to the plan, despite choppy seas, and launched at two miles. At Omaha most of the DD tanks sank. Most of the DD tanks on the British and Canadian beaches were launched close to shore, because of the choppy seas, and survived. The American sector lost 27 tanks that were probably launched too far from the beach. From the 4/7 Dragoons all DD tanks landed on Gold beach. From the 13/18 Hussars 34 DD tanks were launched: 33 landed safely on the beach. After landing the tanks folded down their screen and then were used as a conventional tank. Behind them landed other tanks of Hobarts “Funnies”. Whilst the preparations for D Day were taking place at Stokes Bay with the construction of embarkation hards and Phoenix units, the west end of the Bay, centred around No.2 Battery, was being used from October 1943 as a section of the training school for Duplex Drive tank personnel. This section was known as the Salt Water Training School. The Fresh Water Training School, Water Assault Wing A, was at Fritton Lake, Somerlayton in Norfolk. Initial training took place at Fritton Lake where the tank crews were given escape training, tank training and beach landing skills. The crews then came to Stokes Bay for the sea training at Water Assault Wing B. From January to May 1944 they drove their tanks onto landing craft and proceeded across the Solent towards the Isle of Wight. Approximately 1,200 yards off shore from the beach at Osborne they drove their tanks into the sea and landed on the beach. The danger point was the moment the tanks entered the water when it was possible for the waves to flood over the top of the canvas skirts. One landing craft held nine Valentine tanks or 6 Sherman tanks. Over 30,000 launches were conducted as the Duplex Drive tank training came to a close in May 1944. Valentine DD tank with screen erected, in the water alongside a landing craft, 79th Armoured Division School, Gosport, 14 January 1944. Valentine DD tank being reversed into a landing craft (LCT 882), 79th Armoured Division School, Gosport, 14 January 1944. 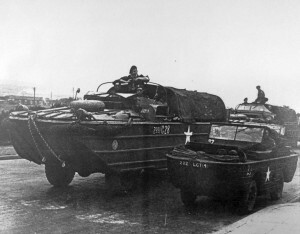 Amphibious, Duplex tanks of B Wing, 79th Armoured Division School lined up on the hardened loading ramp at Stokes Bay, Gosport prior to embarking aboard an LCT during exercises. Amphibious, Duplex tanks of B Wing, 79th Armoured Division School driving on to LCT 782 at Stokes Bay, Gosport during exercises. A Duplex Drive Sherman Tank at Stokes Bay: In the right background can be seen Stokes Bay pier. 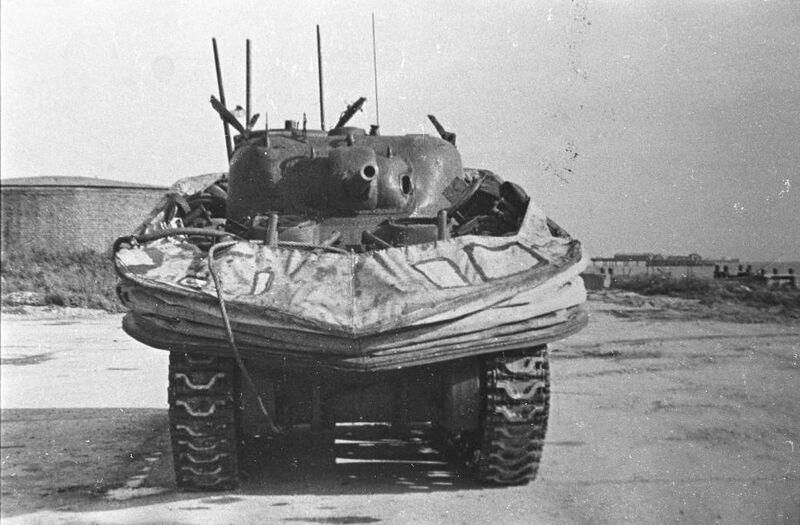 The Duplex Drive (DD) ‘swimming’ Sherman was an amphibious tank used on all five beaches on D-Day. The duplex drive engine powered propellers in water and tracks on land. 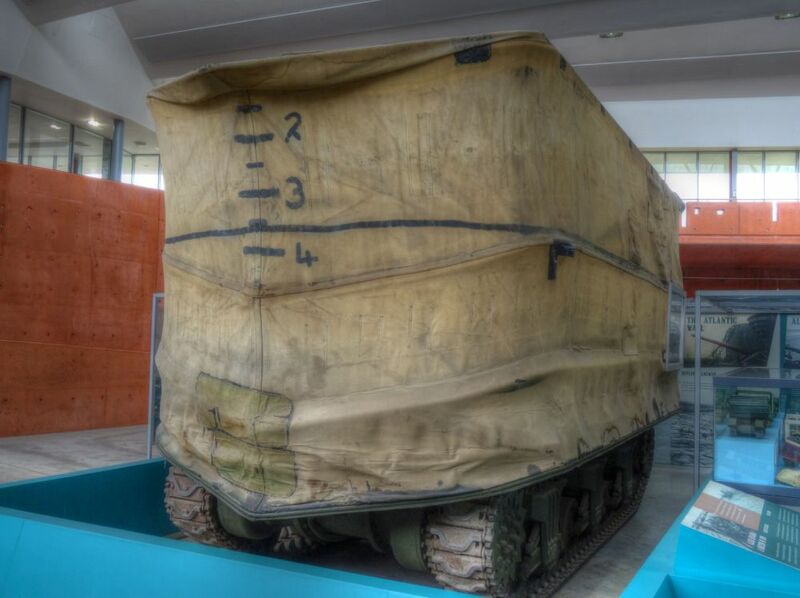 The canvas flotation screen gave the tank enough buoyancy to support its weight without having to sacrifice armour or firepower. Once ashore, the screens were dropped and the tanks became fully operational. This allowed for a quick build-up of armour and provided almost immediate support for the invading infantry forces. Sherman DD (Duplex Drive) with screens lowered. Sherman DD (Duplex Drive) with screens raised. 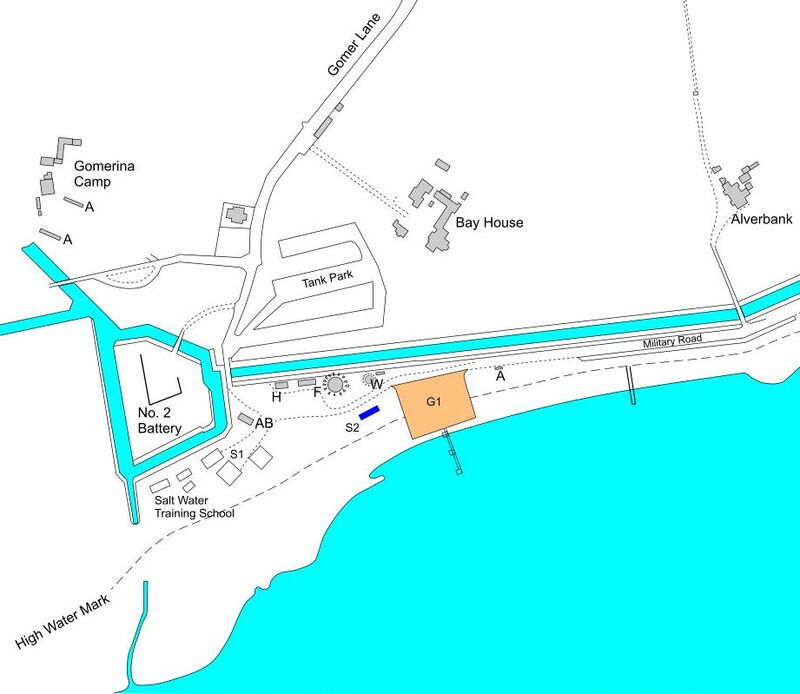 The tank park was constructed at the west end of the beach close to Bay House. Workshops were built south of No.2 Battery. A testing tank was constructed on the beach nearby so that the waterproofing on the tanks could be inspected. Bay House served as the Officers’ Mess and men’s quarters with the residue quartered at Alverbank. 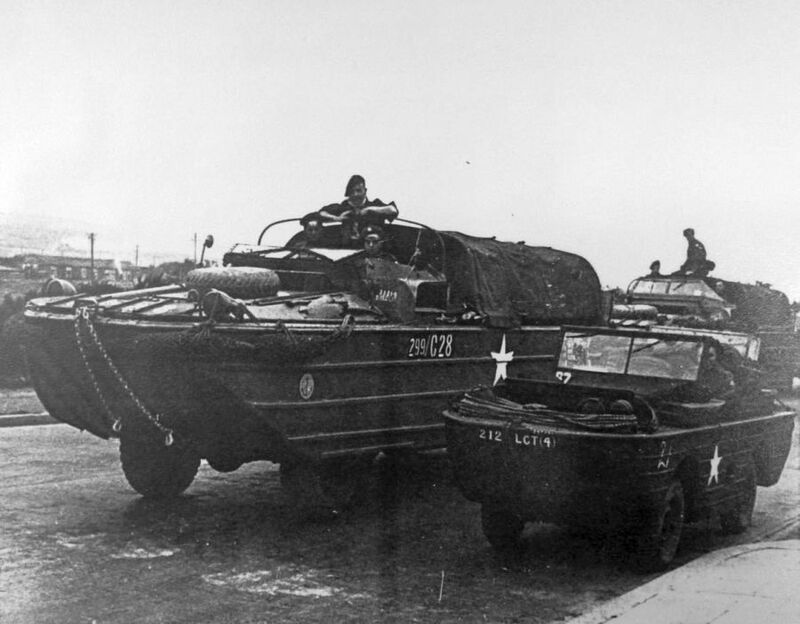 Various Amphibious Operations including Smash, Tiger and Fabious took place along the south coast in preparation for D-Day. After the war the Admiralty held on to No.2 Battery whilst the rest of the Bay was cleared and handed back to Gosport Borough Council. 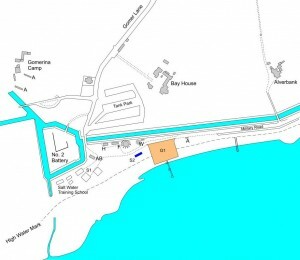 The minutes of Gosport Borough Council recorded in August 1974 Admiralty properties at Stokes Bay were to be de-requisitioned from 25 March; The War Department still requisitioned the whole area but had no objection to opening whole of Bay to the public, except the west end and No.2 Battery occupied by S.A.D.E. (Special Armament Development Establishment) the Amphibious Wing of the 7th Royal Tank Regiment, also based in nearby Fort Gomer. D = Date 1942 – the first year of manufacture. D.U.K.W. vehicles were a common sight driving along Military Road from the garages outside Fort Brockhurst and Fort Gomer to Stokes Bay and back during the 1950s. B) That a 10 mile speed limit should be imposed on the road through the requisitioned area, and that Gosport Borough Council should provided appropriate notices at each end. It was considered undesirable for the public to be given access to the beach within the requisitioned area at the present time. Nor was it desirable for the public to have the use of the public conveniences as this would entail a breach of condition. In 1951 it was reported that the War Department intended to hold on to the Gomer to Browndown crossing section of the Military Road for the time being. In September 1951 it was reported that as soon as the unit at Fort Gomer was evacuated then the WD land at Stokes Bay would be de-requisitioned – hopefully by end of year. Bay House and No.2 Battery were finally vacated by the Amphibious Wing Unit on 15 Nov 1951. Stokes Bay was de-requisitioned on 25 Dec 1951. The tank park became a mobile home park and the concrete roads can still be seen today.